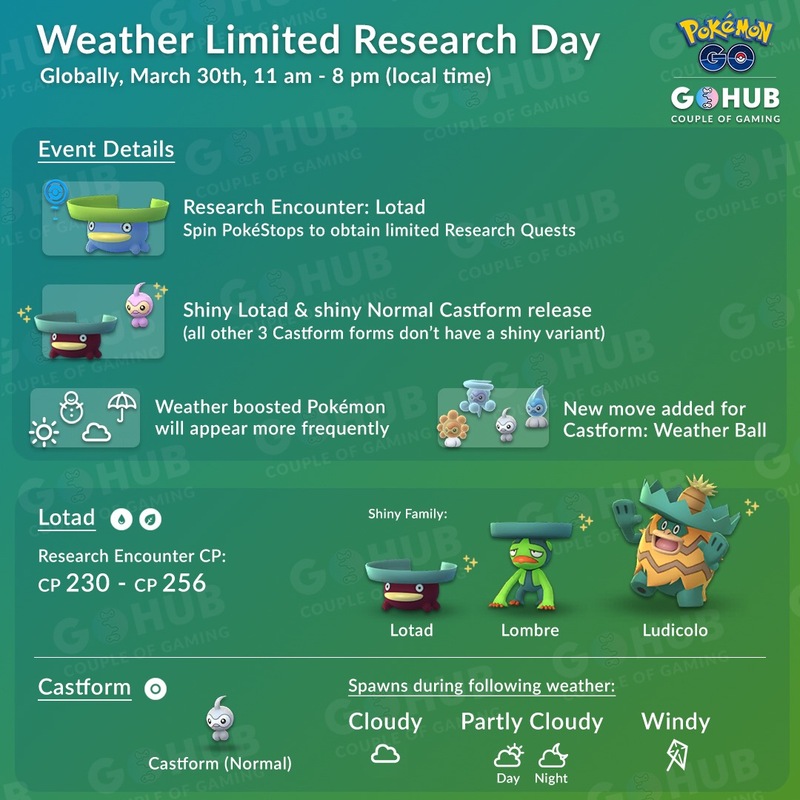 Lotad Research event is a few steps up from the Feebas Day Event and Clamperl Day Event, featuring more bonuses, and a longer timeframe, so this is your guide on how to get the most out of this event! Lotad Day event is on Saturday, March 30th from 11am-8pm in your local time zone. This event lasts nine hours, and is not meant to make you have to go out and play the whole nine hours, but instead give other players with varying schedules a chance to participate. We cannot deny that Lotad spawns mostly in the rain, Cacnea spawns the most in sunny, and Snorunt mostly in snow. This is not taking events into account of course, but have fun trying to find these Pokémon not in their ideal weather condition outside of an event or nest, they are not exclusive to the weather, but are very rare outside of it. Many people are confused as to why only Normal Castform has been released as shiny, and the answer is simple; GameFreak (the company behind Pokémon) has never given Sunny, Rainy, or Snowy Castform a shiny variant. The shiny of these Pokémon simply do not exist, and Niantic cannot make up the variants for them. Let’s take a look at the new shiny Pokémon we should be on the look-out for during this event. Remember, Normal Castform only appears in partly cloudy, cloudy and windy weather, which will be the only time they will have a possibility of being shiny. There is a special event box for the Lotad Research Day, surprisingly! It is not awful, but it is not great either, let’s take a look at it. With lucky eggs being calculated as if they were bought in bulk, making then 63 coins a piece, to give a more accurate analysis, and Ultra Balls being treated as a bonus, here is what you’re saving from this box! It is not the best box, but has a good balance with raid passes and incubators to give low coin players more to do during this research event. This box is better than the current special box, offering more Ultra Balls, an extra Egg Incubator and an extra Lucky Egg! Since this event offers no Stardust or XP bonus, it is not important to be out the entire nine hours playing. Instead, it is best to play as long as you want to, as long as your PokéStops can support you completing all the research, or until you get a shiny Lotad or three, depending on their shiny rate. Wear appropriate clothing. This is almost a given, but always dress accordingly when you are planning on setting out on foot. Bring a hat, sunscreen, jacket, umbrella- whatever your weather forecast is calling for in order to make your day awesome and safe! Manage your research tasks. If you can manage it, it is easiest to complete several of the same research tasks at once, and do not be afraid of tossing tasks you do not feel you can complete quickly in favor of a new one. It is best to travel on foot for these types of events instead of driving, so that you can have time to complete your tasks in-between stops. It is also quicker to run from non-shiny research encounters and use them for any ‘make x throws’ or ‘catch x Pokémon’ quests that may pop up. Otherwise, they can be caught after the event ends, to save time. 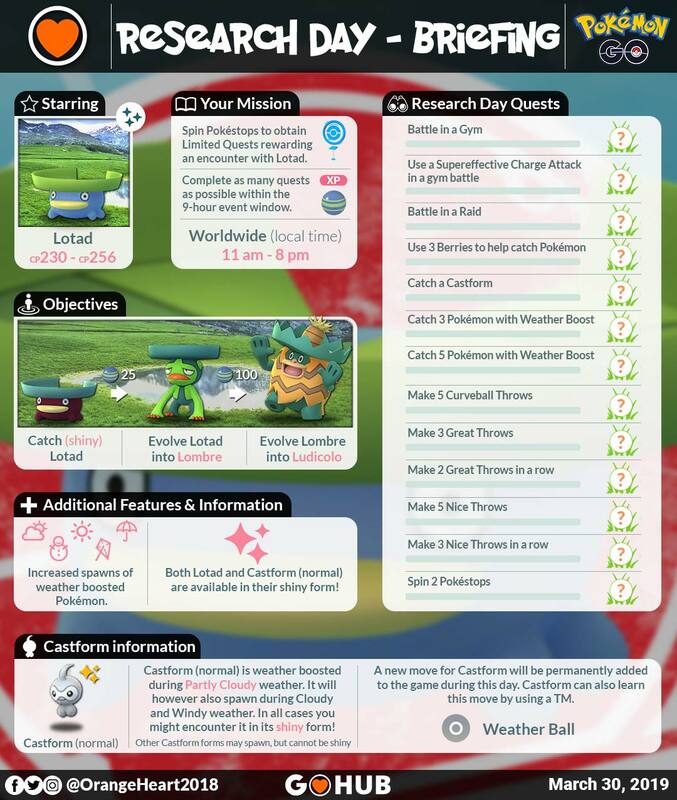 The post Lotad Research Day Guide: quests, box breakdown, Lotad CP appeared first on Pokemon GO Hub.